This example shows how to build a complete Remaining Useful Life (RUL) estimation workflow including the steps for preprocessing, selecting trendable features, constructing a health indicator by sensor fusion, training similarity RUL estimators, and validating prognostics performance. The example uses the training data from the PHM2008 challenge dataset from https://ti.arc.nasa.gov/tech/dash/groups/pcoe/prognostic-data-repository/ . Since the dataset is small it is feasible to load the whole degradation data into memory. Download and unzip the data set from https://ti.arc.nasa.gov/tech/dash/groups/pcoe/prognostic-data-repository/ to the current directory. Use the helperLoadData helper function to load and convert the training text file to a cell array of timetables. 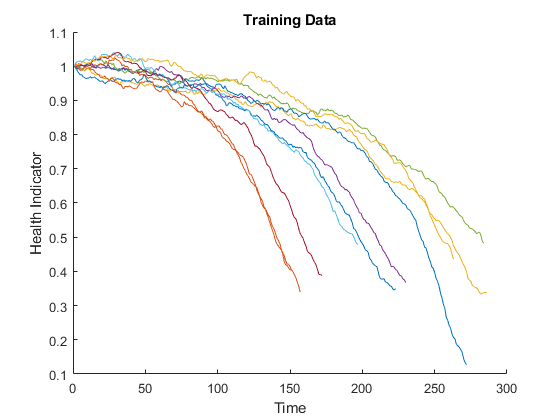 The training data contains 218 run-to-failure simulations. This group of measurements is called an "ensemble". Each ensemble member is a table with 26 columns. The columns contain data for the machine ID, time stamp, 3 operating conditions and 21 sensor measurements. Split the degradation data into a training data set and a validation data set for later performance evaluation. Specify groups of variables of interest. Visualize a sample of the ensemble data. As shown in the previous section, there is no clear trend showing the degradation process in each run-to-failure measurement. In this and the next section, the operating conditions will be used to extract clearer degradation trends from sensor signals. Notice that each ensemble member contains 3 operating conditions: "op_setting_1", "op_setting_2", and "op_setting_3". First, let's extract the table from each cell and concatenate them into a single table. 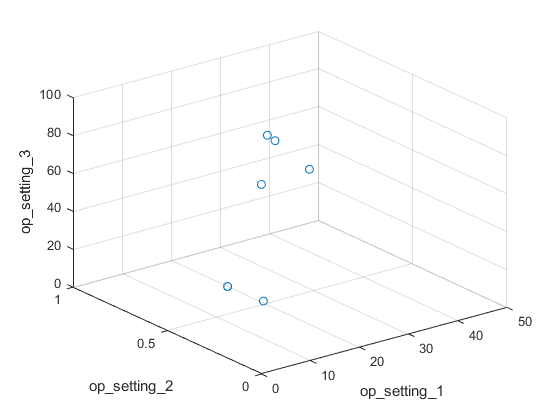 Visualize all operating points on a 3D scatter plot. It clearly shows 6 regimes and the points in each regime are in very close proximity. Let's use clustering techniques to locate the 6 clusters automatically. Here, the K-means algorithm is used. 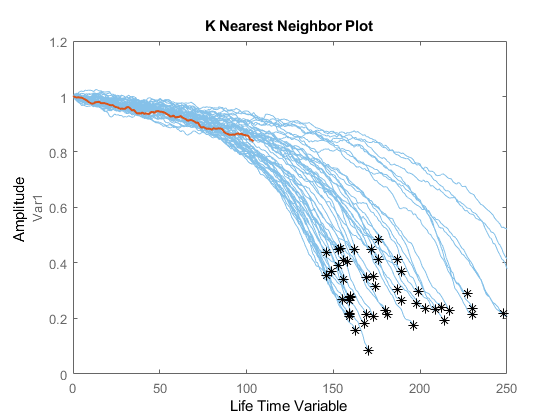 K-means is one of the most popular clustering algorithms, but it can result in local optima. 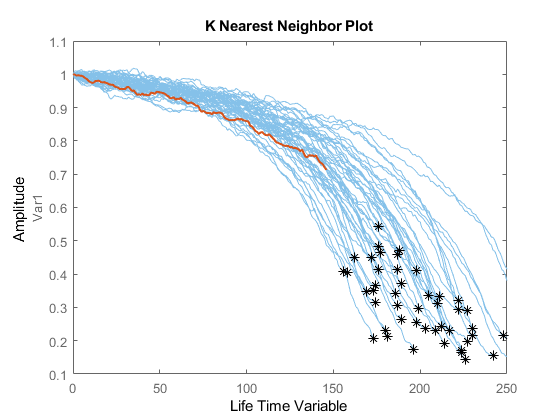 It is a good practice to repeat the K-means clustering algorithm several times with different initial conditions and pick the results with the lowest cost. In this case, the algorithm runs 5 times and the results are identical. Replicate 1, 1 iterations, total sum of distances = 0.279547. Replicate 2, 1 iterations, total sum of distances = 0.279547. Replicate 3, 1 iterations, total sum of distances = 0.279547. Replicate 4, 1 iterations, total sum of distances = 0.279547. Replicate 5, 1 iterations, total sum of distances = 0.279547. 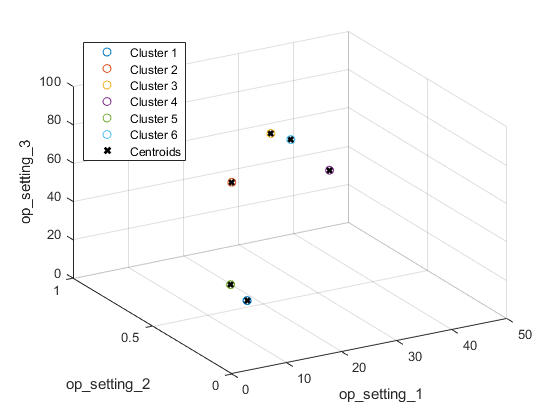 Visualize the clustering results and the identified cluster centroids. 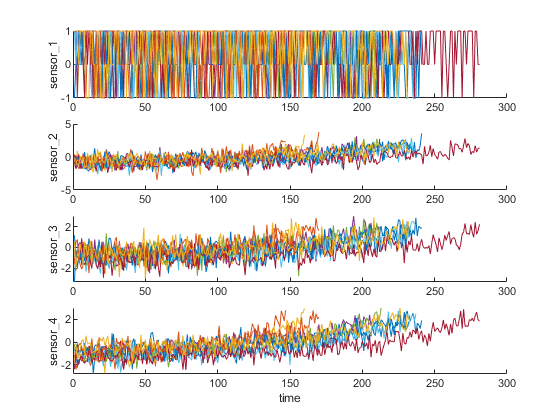 As the plot illustrates, the clustering algorithm successfully finds the 6 working regimes. Let's perform a normalization on measurements grouped by different working regimes. First, compute the mean and standard deviation of each sensor measurement grouped by the working regimes identified in the last section. The statistics in each regime can be used to normalize the training data. For each ensemble member, extract the operating points of each row, compute its distance to each cluster centers and find the nearest cluster center. Then, for each sensor measurement, subtract the mean and divide it by the standard deviation of that cluster. 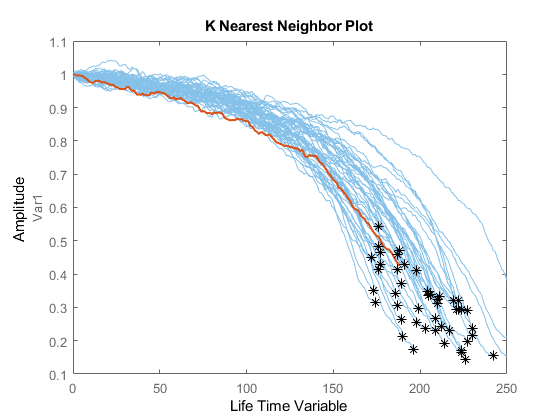 If the standard deviation is close to 0, set the normalized sensor measurement to 0 because a nearly constant sensor measurement is not useful for remaining useful life estimation. Refer to the last section, "Helper Functions", for more details on regimeNormalization function. Visualize the data normalized by working regime. 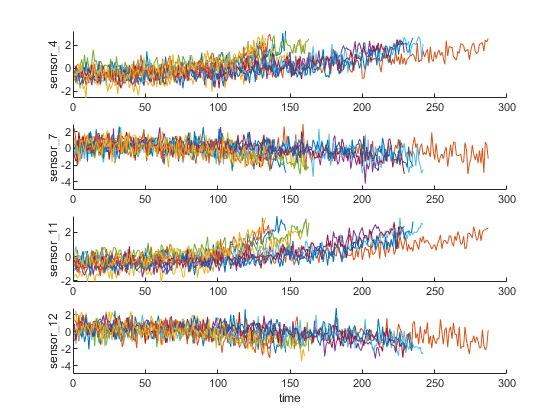 Degradation trends for some sensor measurements are now revealed after normalization. Now select the most trendable sensor measurements to construct a health indicator for prediction. For each sensor measurement, a linear degradation model is estimated and the slopes of the signals are ranked. Sort the signal slopes and select 8 sensors with the largest slopes. Visualize the selected trendable sensor measurements. Notice that some of the most trendable signals show positive trends, while others show negative trends. This section focuses on fusing the sensor measurements into a single health indicator, with which a similarity-based model is trained. All the run-to-failure data is assumed to start with a healthy condition. The health condition at the beginning is assigned a value of 1 and the health condition at failure is assigned a value of 0. The health condition is assumed to be linearly degrading from 1 to 0 over time. This linear degradation is used to help fuse the sensor values. More sophisticated sensor fusion techniques are described in the literature [2-5]. The health condition of all ensemble members change from 1 to 0 with varying degrading speeds. Construct a single health indicator by multiplying the sensor measurements with their associated weights . Visualize the fused health indicator for training data. The data from multiple sensors are fused into a single health indicator. The health indicator is smoothed by a moving average filter. See helper function "degradationSensorFusion" in the last section for more details. Repeat the regime normalization and sensor fusion process with the validation data set. Visualize the health indicator for validation data. Now build a residual-based similarity RUL model using the training data. In this setting, the model tries to fit each fused data with a 2nd order polynomial. where yj is the health indicator of machine j, yˆj,i is the estimated health indicator of machine j using the 2nd order polynomial model identified in machine i. 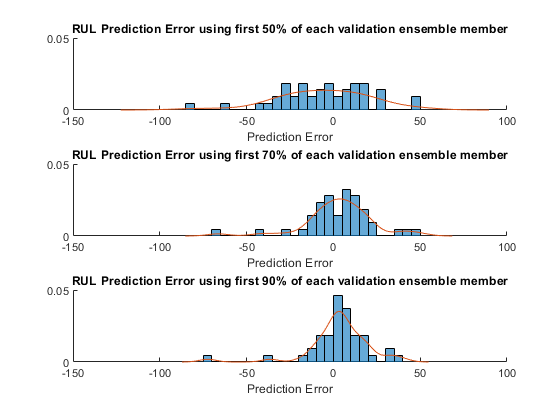 Given one ensemble member in the validation data set, the model will find the nearest 50 ensemble members in the training data set, fit a probability distribution based on the 50 ensemble members, and use the median of the distribution as an estimate of RUL. 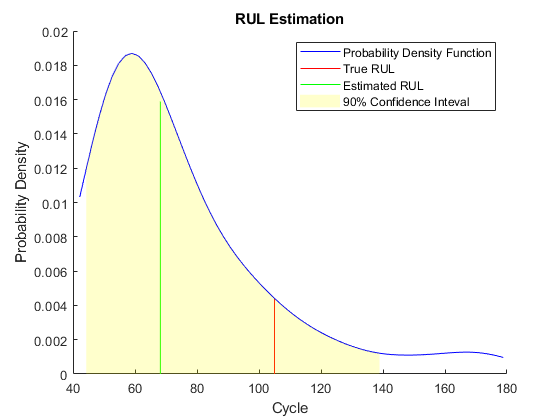 To evaluate the similarity RUL model, use 50%, 70% and 90% of a sample validation data to predict its RUL. Use the validation data before the first breakpoint, which is 50% of the lifetime. 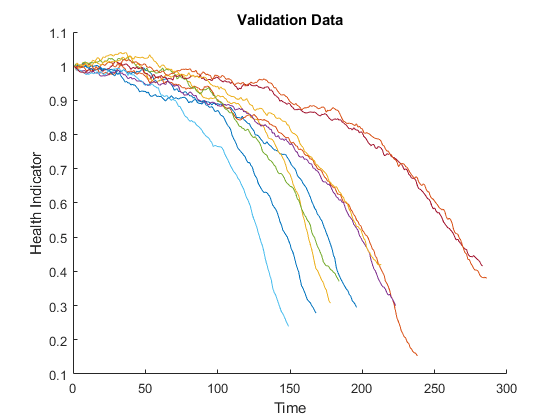 Visualize the validation data truncated at 50% and its nearest neighbors. 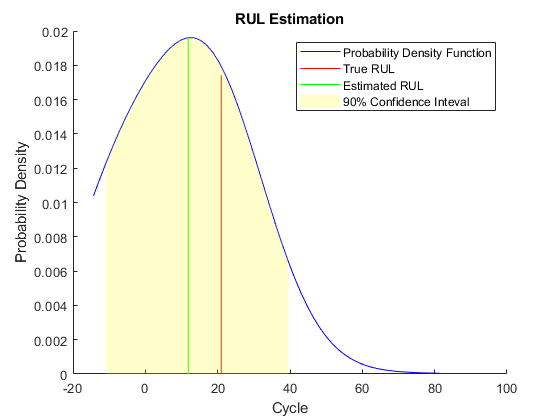 Visualize the estimated RUL compared to the true RUL and the probability distribution of the estimated RUL. There is a relatively large error between the estimated RUL and the true RUL when the machine is in an intermediate health stage. In this example, the most similar 10 curves are close at the beginning, but bifurcate when they approach the failure state, resulting in roughly two modes in the RUL distribution. Use the validation data before the second breakpoint, which is 70% of the lifetime. When more data is observed, the RUL estimation is enhanced. 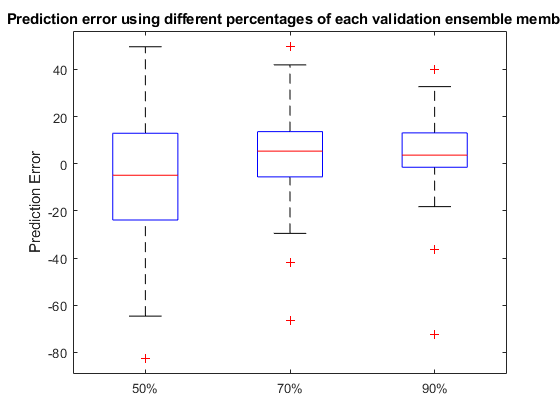 Use the validation data before the third breakpoint, which is 90% of the lifetime. When the machine is close to failure, the RUL estimation is even more enhanced in this example. 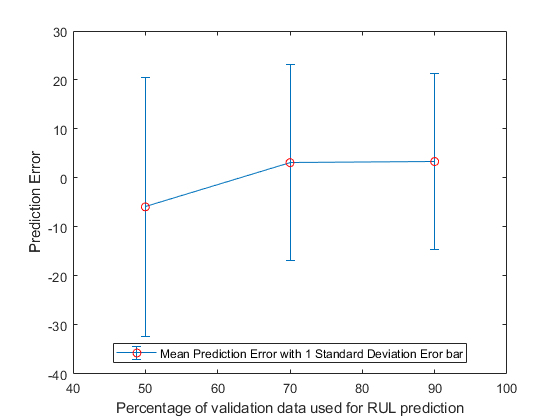 Now repeat the same evaluation procedure for the whole validation data set and compute the error between estimated RUL and true RUL for each breakpoint. Visualize the histogram of the error for each breakpoint together with its probability distribution. Plot the prediction error in a box plot to visualize the median, 25-75 quantile and outliers. Compute and visualize the mean and standard deviation of the prediction error. 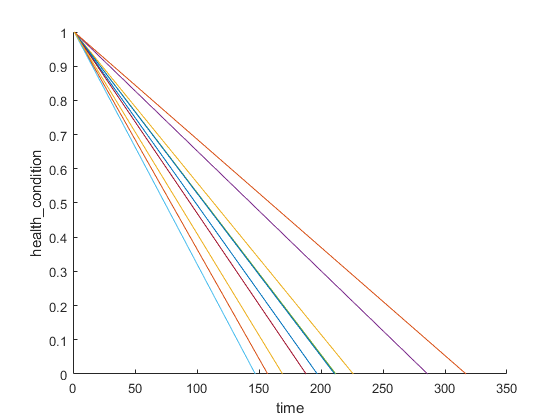 It is shown that the error becomes more concentrated around 0 (less outliers) as more data is observed. Roemer, Michael J., Gregory J. Kacprzynski, and Michael H. Schoeller. "Improved diagnostic and prognostic assessments using health management information fusion." AUTOTESTCON Proceedings, 2001. IEEE Systems Readiness Technology Conference. IEEE, 2001. Goebel, Kai, and Piero Bonissone. "Prognostic information fusion for constant load systems." Information Fusion, 2005 8th International Conference on. Vol. 2. IEEE, 2005. Wang, Peng, and David W. Coit. 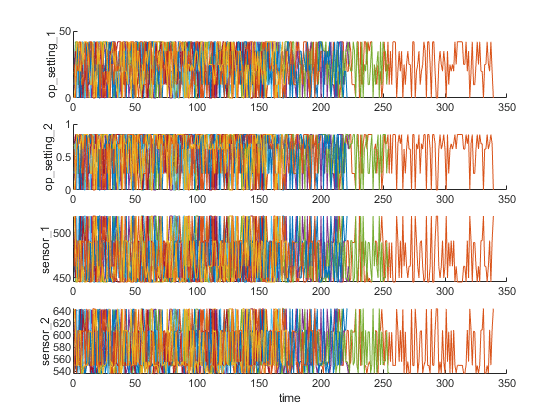 "Reliability prediction based on degradation modeling for systems with multiple degradation measures." Reliability and Maintainability, 2004 Annual Symposium-RAMS. IEEE, 2004. Jardine, Andrew KS, Daming Lin, and Dragan Banjevic. 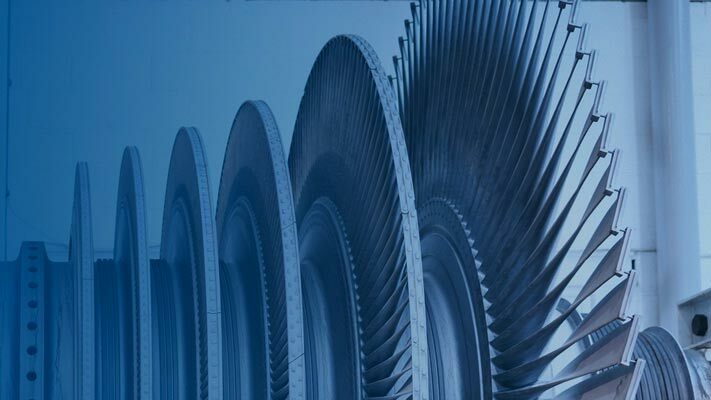 "A review on machinery diagnostics and prognostics implementing condition-based maintenance." Mechanical systems and signal processing 20.7 (2006): 1483-1510. % according to the cluster the observation belongs to. % Normalization operation for each row. % Normalize the sensor measurements by the mean and standard deviation of the cluster. % Reassign NaN and Inf to 0.